ab23418 is highly specific for perlecan. There is no evidence for cross-reactivity with other connective tissue proteins (vitronectin, fibronectin, elastin, collagen, laminin). Epitope is located in domain V of Perlecan. Our Abpromise guarantee covers the use of ab23418 in the following tested applications. WB 1/100. 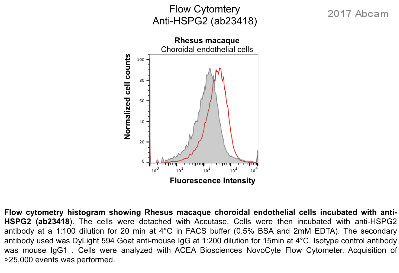 Predicted molecular weight: 469 kDa. AP Use at an assay dependent concentration. Can be used to separate recombinant domain I from full length perlecan. Immunohistochemical analysis of Human ovary tissue, staining Heparan Sulfate Proteoglycan 2/Perlecan with ab23418. Tissue was fixed with paraformaldehyde and antigen retrieval was by heat mediation. Samples were incubated with primary antibody (1/10 in diluent) for 30 minutes. An HRP-conjugated anti-mouse IgG was used as the secondary antibody. ab23418 staining Heparan Sulfate Proteoglycan 2/Perlecan in Human fibroblasts by ICC/IF (Immunocytochemistry/immunofluorescence). Cells were fixed with methanol, permeabilized with 1% Triton X-100 and blocked with 5% BSA for 20 minutes at 22°C. Samples were incubated with primary antibody (1/600 in diluent) for 12 hours at 4°C. An AlexaFluor®488-conjugated goat anti-mouse monoclonal (1/200) was used as the secondary antibody. Publishing research using ab23418? Please let us know so that we can cite the reference in this datasheet. I have a HSPG2 antibody ab23418, i am wondering which epitope is it against (which part of HSPG is it against), the menbrane binding protein part or the outside protein part or the out side glycan part and so on. No signal in western blot. Dear Sir/Madam, we are looking at Human Heparan Sulfate Measurements in cultured fibroblasts. 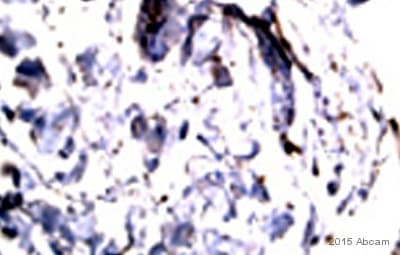 We usually use your anti-Heparan Sulfate Proteoglycan 2 antibody- A74 (ab23418) and we would like to realize a range with a recombinant HSPG2 protein in order to quantificate the HSPG2 presents in our cells. I am looking forward to your reply as soon as possible. Please have a look. Thank you very much. Thank you very much for contacting us and for your patience. I apologise for the delay. We have contacted the originator of the Anti-Heparan Sulfate Proteoglycan 2 antibody [A74]ab23418and enquired about epitope details. Unfortunately, there are no more details available than what is already stated on the datasheet: The epitope is located in domain V of Perlecan. We unfortunately have only one Heparan Sulfate Proteoglycan 2 protein available in our catalog: ab114285 is a recombinant fragment of Human Heparan Sulfate Proteoglycan 2, amino acids 25-134.As thisrange of amino acids is different from domain V, ab114285 is therefore not a suitable option for your experimental setup. We aim to provide as much information as possible to customers, so I am sorry that this has not been possible on this occasion.Please do not hesitate to contact us again with other needs or with any questions about our products. Test de ab86750 et ab23418 en ICC/IF. Je suis ravi que vous souhaitiez participer à notre offre et tester ab86750 et ab23418 en ICC/IF. Les codes de réduction ci-dessus sont utilisables sous 120 jours et pour l’achat de deux autres anticorps primaires. Vous devez dans un premier temps soumettre une Abreview avec vos résultats ICC/IF en notant ce code dans la section « Additional notes ». Ce code sera ainsi activé et vous pourrez par la suite contacter notre service clientèle par téléphone pour passer votre prochaine commande, en vous munissant des informations suivantes : code de réduction, numéro de commande de ab86750 et ab23418. If possible, I would like to know the correct amino acid sequence recognized by b 23418 Anti-Heparan Sulfate Proteoglycan 2 antibody [A74]. Thank you for your inquiry. Unfortunately we have no information on any aa sequences for this antibody other than it is corneal endothelial cells from cow. Below is listed the following prices: Please let me know if I can be of further assistance.